Drive Alive, a road safety awareness organisation in South Africa, recently used 3D cinema advertising to remind young adults about the impact of alcohol on drivers. Working with TBWA South Africa Drive Alive worked with TBWA South Africa to target 3D moviegoers between the 2nd of December and the 6th of January at cinemas countrywide by creating a commercial that shows a brief clip of a drunk driver on a joy ride. 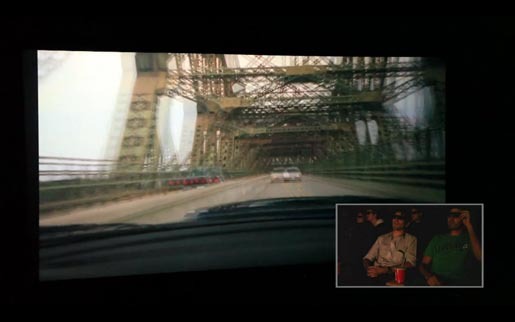 The commercial, however, fades in and out of focus, making viewers suspiciously check their 3D glasses. Drunk Driving is one of the biggest threats to Road Safety in South Africa, particularly over the festive season. Research indicates that 50% of people who die on the roads have a blood alcohol concentration above 0.05 gram per 100 milliliters. But this remains a useless statistic as most people only face the harsh reality of driving drunk after they suffer the consequences. 3D cinema is something people watch to enhance their senses and their experience. Trying to watch a 3D movie that’s not in 100% focus is an extremely unnerving experience. And that’s exactly what Drive ALive wanted to do to the commercial’s viewers. The Drive Alive 3D campaign was developed at TBWA\South Africa, Johannesburg, by creative director Justin Wright, art director Byron Fraser, copywriter Jarod Osmond, executive creative directors Damon Stapleton, Matthew Brink, Adam Livesey, and producer Sandra Gomes. Filming was shot by directors Sam Alessandri and Nick Young with production at The Refinery, Johannesburg, by producers Ancilla Berry and Odette de Nobrega. 3D encoding was done at Spectrum Visual Networks by Anthony Yew.